Have you been missing the chicken in your chicken sandwich lately? At Rich Chicks we don’t add fillers, binders, artificial colors or flavors to our whole muscle chicken breast fillets. Enjoy the rich flavor and premium quality of our truly whole muscle chicken breast fillet, whole grain breaded with a spicy kick and ready to eat, the way it was intended. Rich Chicks, unrivaled quality, Rich in Flavor, Rich in Nutrition. 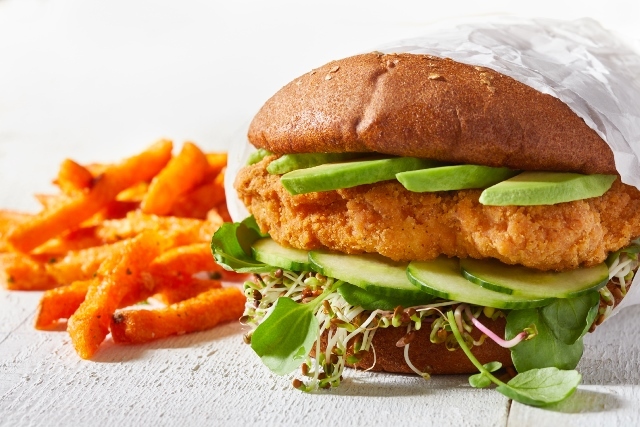 On a freshly toasted whole wheat bun, add a light spread of Whole Seed Mustard, Rich Chicks Premium Gourmet Spicy Whole Grain Breaded Whole Muscle Chicken Breast Fillet, a heap of fresh sprouts, thinly cut cucumber and thick wedges of fresh cut avocado. And for an extra kick, add some thinly sliced fresh jalapeno, if you dare. Build, enjoy, repeat. Rich Chicks, it’s what’s for lunch or dinner or whenever! Convection Oven: Bake at 375°F for 10-12 minutes. Conventional Oven: Bake at 375°F for 12-14 minutes. Chicken Breast with Rib Meat, Chicken Protein Solution (Chicken Protein, Water), Isolated Oat Product, Salt. Breaded With: Whole Wheat Flour, Enriched Wheat Flour (Enriched with Niacin, Reduced Iron, Thiamine Mononitrate, Riboflavin, Folic Acid), Salt, Spice Extractive, Yeast, Sugar, Extractives of Paprika. Pre-dusted and Battered With: Whole Wheat Flour, Enriched Wheat Flour (Enriched with Niacin, Reduced Iron, Thiamine Mononitrate, Riboflavin, Folic Acid), Modified Corn Starch, Salt, Egg Whites, Leavening (Sodium Acid Pyrophosphate, Sodium Bicarbonate), Soybean Oil (as Processing Aid), Spice Extractive, Extractives of Paprika. Breading Set in Vegetable Oil.